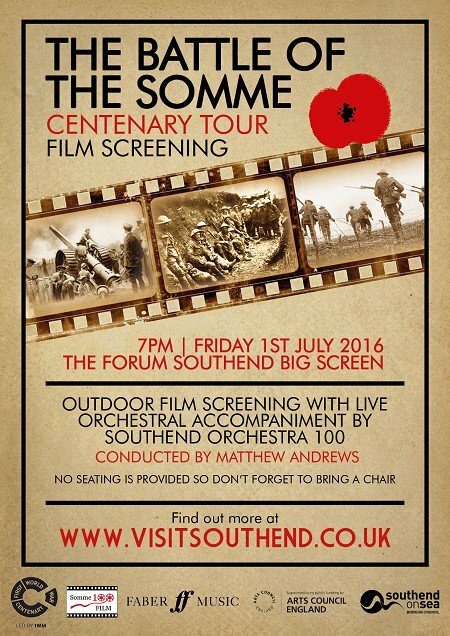 On July 1st 2016 Southend put on a live orchestral screening of The Battle of the Somme to commemorate the Centenary of the first day of the battle. 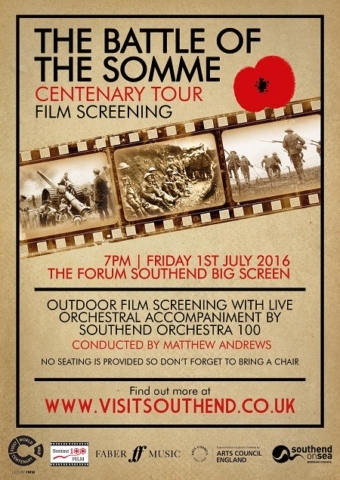 They formed an orchestra called Southend 100 especially for the event, made up of students, parents, music teachers and local musicians. The film was screened outdoors on a large screen to a captive audience with many in rain coats! 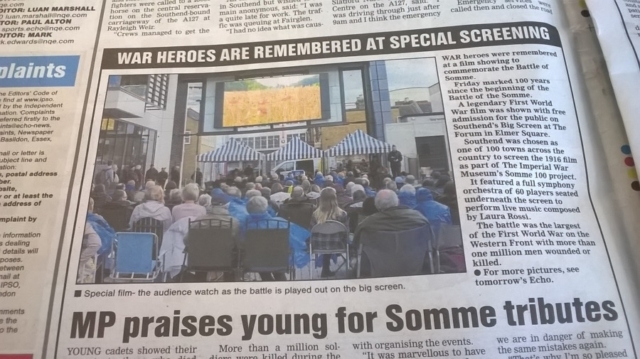 We had a very moving event on Friday, and the feedback was extremely good all round. It poured at 7pm so we held back on the talks for 5 minutes or so while we rushed round with ponchos! However, the rain stopped very quickly and we had a 2 hour dry window, which was so fortunate. Simon Moston, our Somme Guide and Toby Haggith were both excellent speakers, and added a great amount to the film and the music. 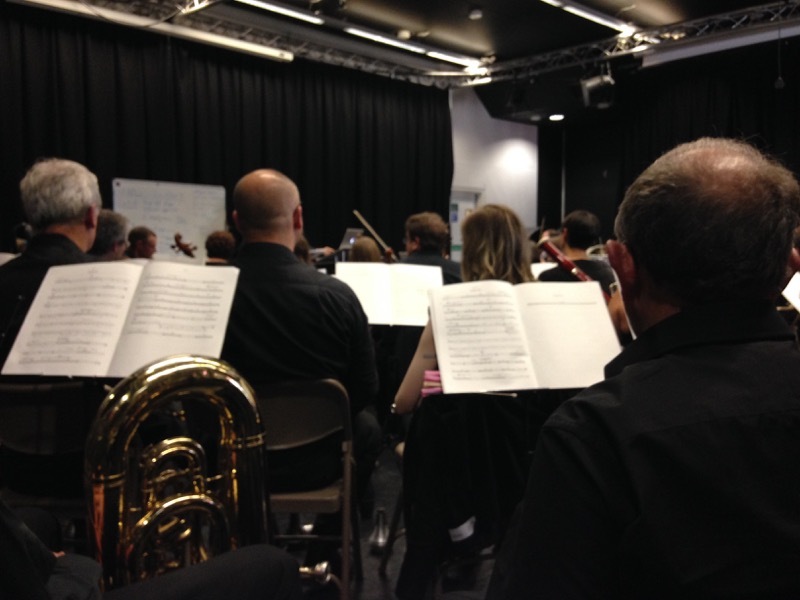 The orchestra were amazing – some of them had only had an hour’s rehearsal on the day in the very cramped rehearsal studio, and we had less than 3 minutes sound check! I was so pleased that we were able to involve several young players from our 2 youth orchestras, and they were extremely well supported by experienced teachers and semi pro players. Our conductor, Matt Andrews was amazing – keeping everything going and even mouthing rehearsal letters on occasions to help everyone keep on track. I was at the back of the gazebos in the orchestra, so it was difficult to judge from where I was, but the audience all said how well the orchestra came across. I was able to see some of the audience from the back of the orchestra, and it was obvious from their faces how moving they found the whole experience.